I posted a photo of my first ever foil manicure on the Silly Bee's Chickadees Facebook page and got such a great response, that I thought I'd share the super easy tutorial with you! I love the turquoise stone, it's just so earthy and natural with beautiful flecks and veins. The gemstone comes in several colors and variations. Some has veins with minerals that look like gold. That variety is the inspiration for this mani. Enjoy! 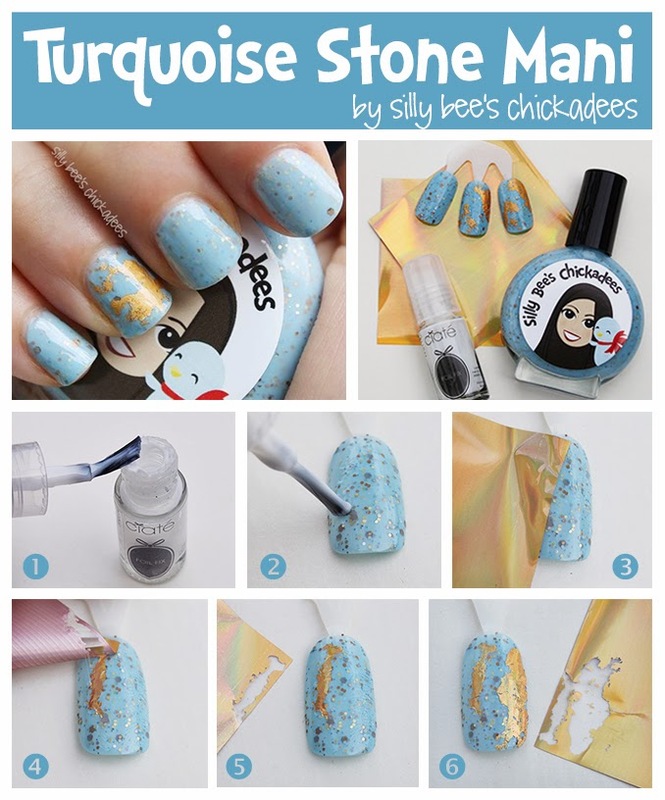 You'll need Silly Bee's Chickadees Always Azure, Gold holo foil, foil glue and a clear top coat. First, I started with two coats of Always Azure, which is full of gold and copper glitter and compliments the gold foil nicely. Make sure you let the polish dry completely before you move on. 1. Take your foil glue and wipe off most of the glue from the brush. We don't want giant splotches of foil on the nail-- it should look jagged like the cracks in a rock. 2. Dab the glue onto the nail like you are stippling. Don't brush it across. You may not even see the glue at this point and that's ok. Foil just needs the tiniest bit of glue to stick. 3. Allow the glue a minute or two to dry. The glue should be clear by this time. Then, press the foil, shiny side up, onto the nail. 4. Gently lift the foil. If bits of foil stay behind, that's ok. The texture of the polish makes the foil look crackle-y and natural. 5. If the foil doesn't look perfect, that's perfect! (hee hee) Turquoise stones aren't perfect and that's what makes them beautiful. Do one or two more spots and you're done! 6. Add a clear top coat to seal the foil. If you don't, it will rub off. That's it! Doesn't it look like a turquoise stone? I love it. Thanks for following along!